Happy New Year a few weeks late. Hope you all had a beautiful holiday season. After finishing the Goldfinch and book club being off for December, I was so excited to jump into a couple of books off my personal reading list. 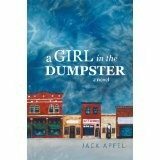 Topping that list was A Girl in the Dumpster by Jack Apfel. This novel is his first published novel and is set in small town Wisconsin. The town is based on his own hometown. Growing up in a small town, I could relate to the 2 teen women in the story. Everyone knows your business and we all have known girls like them. The story collides the lives of 5 women ranging in age from the difficult teen years to middle age parents and aging. The twists and turns in this book will keep you guessing. Just when I thought I had it figured out, it turned again and I was wrong. Mr. Apfel takes the reader into a world of teenage drug and alcohol abuse, loneliness, mental illness and the struggles of infertility. Honestly, when I got to the start of the drug and alcohol abuse, I sighed and took a deep breath. Wondering if I could get through the book after coming off the Goldfinch and it’s graphic drug use. But, I sucked it up and continued. A Girl in the Dumpster was different and I fell in love with the characters. They are real, they are damaged in different ways. Damaged by people, life and poor parenting. All of them struggling with life and trying to find their way. This book pulled at my heart strings. I wanted to shake two moms to wake them up, hug the young girls and sit down with a cup of tea with the older woman. Isn’t this what a book should do for us. Pull us in and make us feel something, A Girl in the Dumpster did just that for me. I thoroughly enjoyed this book and am seriously considering using it for my book club month. If you add it to your reading list, which I think you should and you read it, please jump on and let me know your thoughts on the book. I can’t wait to see what Jack Apfel writes next.